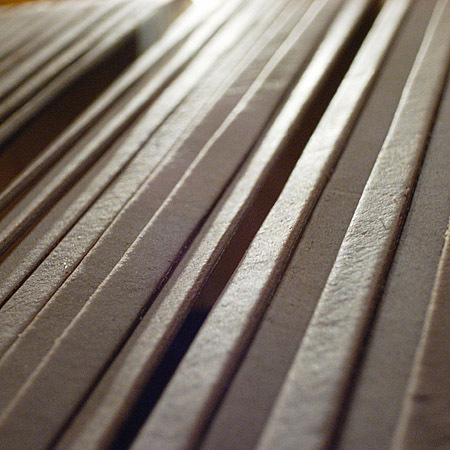 Chocolate pasta suspended for drying. For this round of TGRWT I decided to use the recipe (Chocolate Carbonara with Parmigiano Reggiano Cream and a Chocolate-Dipped Grissini Wrapped in Prosciutto di Parma) by Masaharu Morimoto which I’ve blogged about previously. I was quite intrigued by that recipe and wanted to try it! So here it is, converted to metric units with some small adjustments. The original recipe called for 4 eggs, but this rendered the pasta dough to hard. I added two of the whites which were left over from the sauce. BTW this is why one of should better weigh out eggs instead of count them (too bad I didn’t think about his from the beginning so I could have weighed the eggs I used). The original recipe called for bread sticks with chocolate and prosciutto di Parma which I skipped (but which nonetheless sounds like a good accompaniment – as you’re probably aware of meat and chocolate also go very well together!). In previous posts and comments I have suggested that flavour pairings based on key odorants could be explored by looking at odor activity values (= ratio of volatile compound to it’s threshold). If two foods share one or more key odorants, chances are that they will go well together. It is also reasonable to assume that the more key odorants are shared, the more similar the flavours will be and the more likely it is that the foods will blend well and match each other. To compare this with a random pairing I search for more OAVs and found data for parmigiano reggiano and mango, so I repeated the excercise. 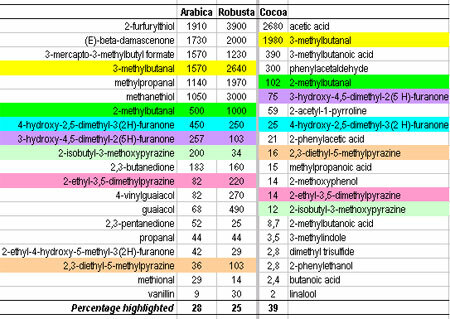 Among the 20 odorants with the highest OAVs respectively for coffee and mango there was no overlap. A neglibile overlap was found between cocoa and mango: one odorant (linalool) was present in both with OAVs corresponding to 0.03% and 0.05% of the “odor activity” respectively. The fact that there is no overlap between coffee or cocoa and mango does not imply that they don’t go well together, only that their key odorants don’t match. Parmigiano reggiano and cocoa however had a lot in common, as seen from the table below. In fact 6 out of 20 key odorants, representing 36% and 89% of the “odor activity” for parmigiano reggiano and cocoa respectively. Sift flour and cocoa powder together and knead in the eggs and olive oil for 15 minutes. Rest for another fifteen minutes then roll and cut in a pasta machine. Heat up a pot of lightly salted water and boil pasta until al dente. In a medium sauce pot scald the cream. In a separate bowl, whisk together egg yolks, Parmigiano Reggiano, and sugar. Temper this mixture into the hot cream and bring to a light simmer, whisking constantly to prevent curdling. Unfortunately I couldn’t find any OAVs for garlic, so I haven’t been able to verify the triple pairing forming the basis for TGRWT #1. The claim was that coffee has dimethyl sulfide in common with garlic, and methyl pyrazine in common with chocolate. 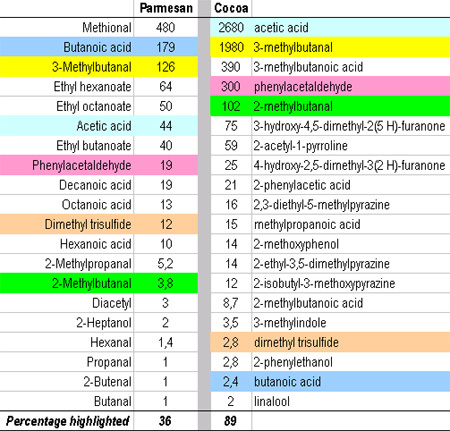 The table above confirms that coffee and chocolate have several methyl pyrazines in common, but dimethylsulfide is not among the 20 key odorants in coffee. This puzzles me, but there could of course be other volatile compounds that garlic shares with coffee. There should also be quite a difference between raw garlic (not to mention between whole, crushed and possibly even minced) and roasted garlic. If I overlooked something (or perhaps a paper with OAVs for garlic), please drop me an email about this. The OAVs of garlic could easily be calculated if data on volatile compounds in garlic and threshold concentrations are available. So there are obviously similarities similarities between coffee, chocolate and garlic, but the question is whether these compounds are key odorants or not. It’s only fair enough to add that the concept of odor activity values has it’s limitations. Some are related to matrix effects, because thresholds are not necessarily recorded in a matrix mimicking the food product. Possible synergies between flavour compounds are disregarded (examples are known where sub-threshold concentrations are detected in the presence of other volatile compounds). Also, the underlying assumption that the odor intensity increases linearily is not quite correct. 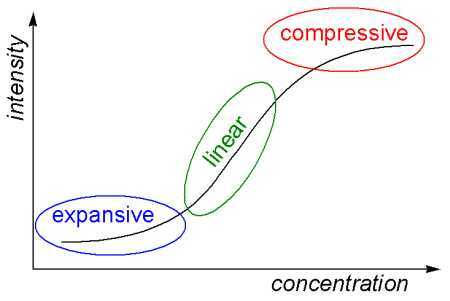 The typical intensity vs. concentration curve is more ‘S’ shaped with an expansive, linear and compressive region as shown below. At low concentrations (expansive region) synergism (also known as hyperadditivity or mutual enhancement) is observed. At high concentrations (compressive region) antagonism (or subadditivity or mutual suppresion) is observed. This means that a high OAV overestimates and a low OAV underestimates the impact of the individual compounds. This also means that the odor activity percentages calculated for the pairings above should be take with a pinch of salt. In between these extremes normal additivities are observed. Even though OAVs are not phsychophysical measures of the perceived odor intensity, they compare quite well with models that take different aspects of sensing into accout. The validity of the found OAV can also be tested by a recombination of the flavour compounds to see how good it imitates the original product studied. I can recommend the freely downloadable article “Evaluation of the Key Odorants of Foods by Dilution Experiments, Aroma Models and Omission” (DOI: 10.1093/chemse/26.5.533) for those interested in reading more about the science. Despite the drawbacks and limitations I think OAVs can and will be helpful when studying the flavour pairing hypothesis. Tips: You can read more about OAVs in books which are (partly) available through Google books.